Double tap near 12 oclock to unlock watch. Single tap to relock watch. Tap 9 oclock to scroll through 4 step darkness filter. Tap 6 oclock to scroll through ambient options. Tap 3 oclock to change background and second hand color. 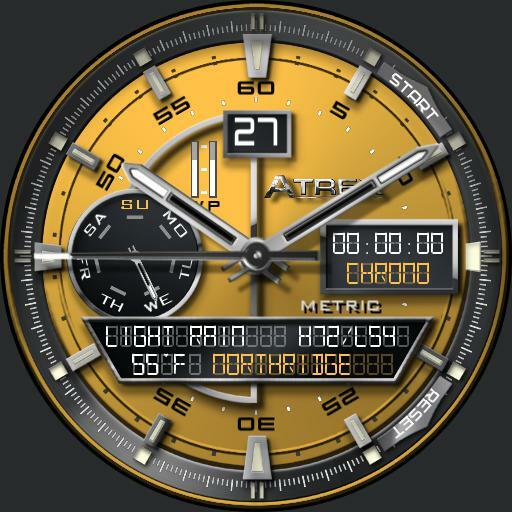 Tap right digital display to scroll through chrono, steps and 24hr time. Tap start and reset to operate chrono. Tap 7 and 10 to scroll ucolor. Tap center of hands to make them temporarily disappear. Tap lower center digital display to update weather. Shows temperature, location, current conditions, hi/lo temps, date, phone and battery levels.